Preis 35 Euro inkl. MwSt. Book for all those collectors who are interested in entires once dispatched at Foreign Postal Offices in China at the turn of the 19th to 20th century (see the TOC below). On the 265 pages are shown about 700 bw pics of covers and cards. 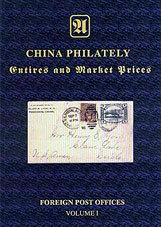 In addition the book contains some historic cards of that region and images of postal cancellations of the Russian Post in China according to Tschilinghirian.